When we first started talking about RVing full-time, we had no idea how much it cost to live full-time in an RV. Was it going to cost more than living in a house? Was it going to cost less? How much would we spend on gas a month? I had no idea, and I wasn’t about to uproot my life if we couldn’t afford it. 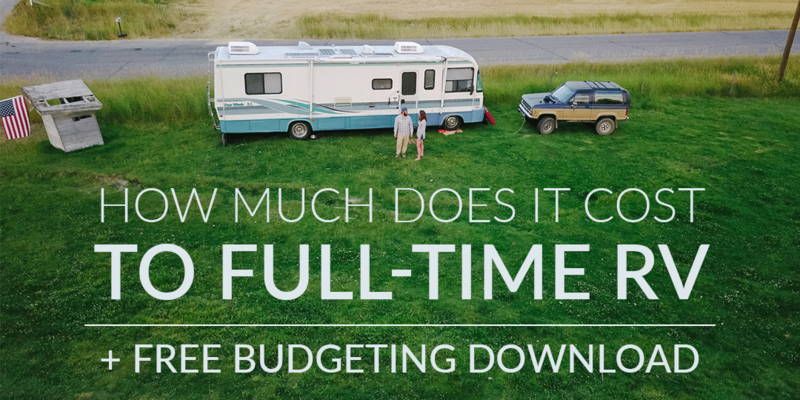 If you’re wondering how much it costs to full-time RV, well, then you’re in the right place. 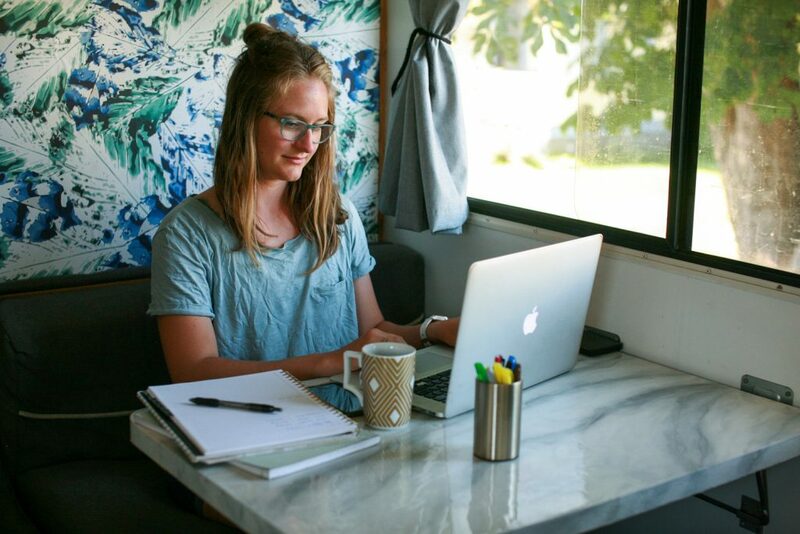 If you are thinking about RVing full-time and wondering if you can afford it, this post is for you. 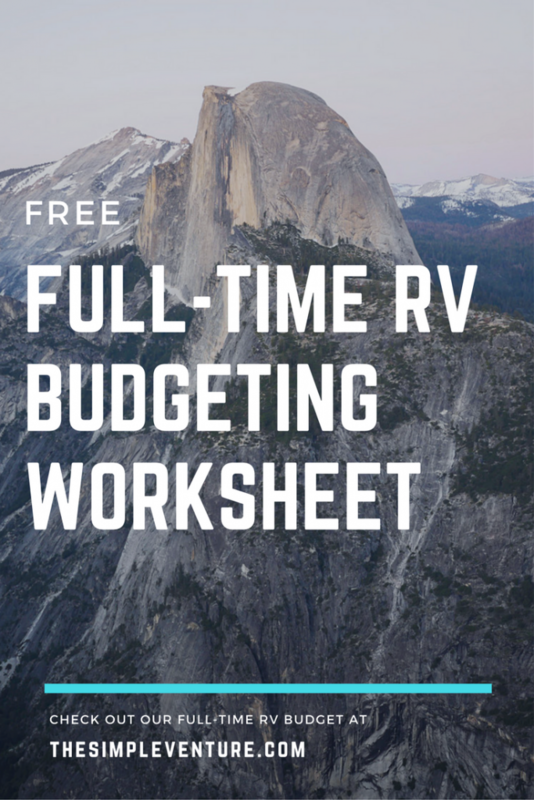 Ready to start planning your full-time RV budget? Download our interactive budgeting worksheet. 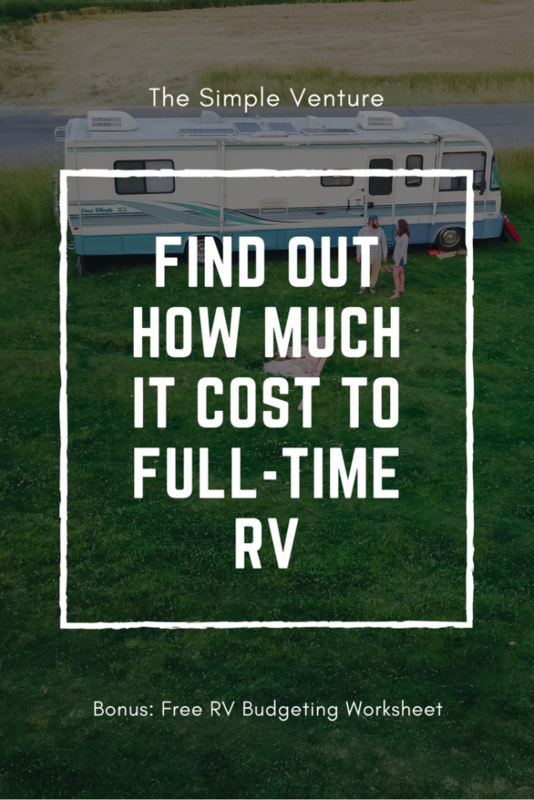 So How Much Does it Cost to Full-time RV? Living and traveling full-time in a RV is of course not free, but I was surprised how affordable it can be. You actually have a lot flexibility when it comes to expenses – depending on your budget and how you like to travel. Think of campsites like your mortgage or rent. Campsites are, in my opinion, where you can either spend the most money or make full-time RVing cheaper than “normal” life because there are so many options. 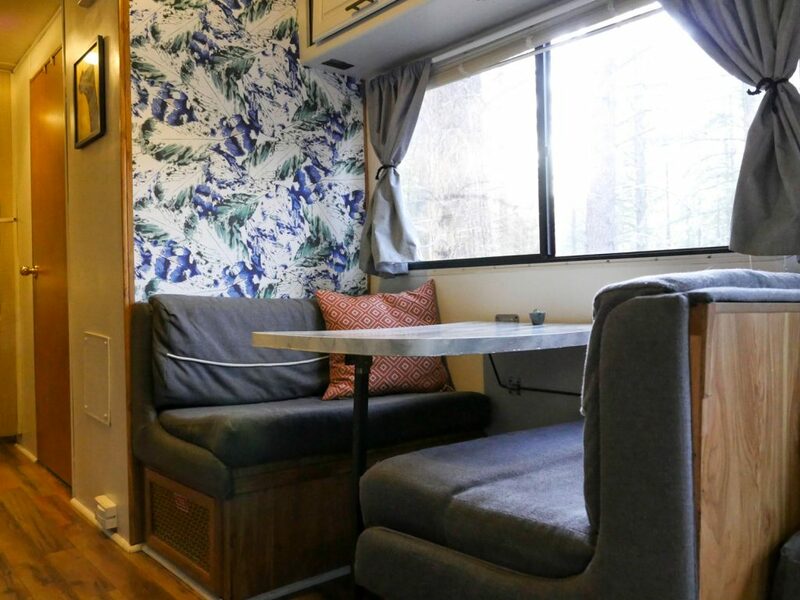 Depending on your budget and camping style, you can stay in RV parks, State Parks, on free Boondocking land, or utilize a RV host website. Learn more about different places to stay here. Bonus: You are able to fill-up potable water and dump your tanks at no extra charge. State Park campground fees will vary by state and what is offered. We’ve been found State Park campgrounds with partial hook-ups (electric, usually water) anywhere from $15-25. Dump stations are hit or miss. Most State Parks with dedicated campsites that do not have hook-ups will range from $10-15 in our experience. Boondocking is basically camping at free spots without hook-ups. Several State Forests and BLM (Bureau of Land Management) locations have free dispersed camping. Typically, you can stay in one location for a maximum of 14 days. We have also found a few state parks have free campsites. While this option is free, you do have to find and pay for dump stations. There are several RV websites out there that allow you to pay an annual fee to camp at members’ locations. For example, we use Boondockers Welcome which costs us $25 a year. We are able to stay with Boondockers Welcome hosts throughout the country for no additional charge. Another website out there is called Harvest Hosts. We’ve haven’t tried this one yet, but it looks awesome! Usually, we can spend a few nights a month at different host locations. At $25-45 a year, it pays for itself after a few nights. We budget $200 a month for campsites, which means we are boondocking the majority of the month. As long as it’s not too hot, we usually dry camp on BLM land or at State Forests. It works great for us – we can let the dogs run free, have plenty of space to spread out, and it’s free! Honestly, I’m not sure if there’s a way to generalize the gas budget, since gas prices, gas mileage, and the number of miles you travel varies so much. BUT I’ll do my best to help you make your own gas budget. Determine your gas mileage. If you are RVing with a tow-behind car, make sure you calculate your mileage when towing. Next, plot out your trip on Google Maps. Since we are traveling for 7 months before heading home for the holidays, we put all our stops for the next 7 months on the map to get the total mileage. Then, find the average gas price for the area you are traveling. We used the nationwide average, since we went coast to coast. Or skip the math and use the Gas Buddy Trip Calculator. If you are a member of Good Sam Club, I highly recommend using their Trip Planner. It works like Google maps but gives you an RV estimated drive time and a gas budget. Don’t forget to add in gas money for your car if you plan on parking the RV and driving to do things. So again, this varies month to month depending on how far we travel, the gas prices and how much driving around we do in our tow-behind car. We typically spend between $300-$500 a month on gas. Since our RV is our home, we upped our RV insurance when going full-time. I recommend doing some research on providers and finding out exactly what you need. Our RV insurance plus our tow-behind car is around $145 a month. If you’re planning to RV full-time, just know things break – often. This isn’t to scare you – full-time RVing is totally worth it, but just be prepared to spend $50-100 a month on repairs or maintenance. Thankfully, Luke can fix most things on our RV, so we just have to buy the parts. Depending on the condition of your RV and your handiness, you may need to adjust this number. Remember, you’ll also be putting some miles on your RV, so oil changes and regular maintenance should be in your budget. Worst case scenario: our RV’s transmission went out a month before we were supposed to head out on our trip. That took $2000 out of our emergency fund before we even started, but it gave us peace of mind that the transmission would be good for the trip. So, we kind of got lucky. Moral of the story: have an emergency fund that can cover your worst case scenario. While you may no longer have a water, sewer, or trash bill, you may need to include utilities in your budget. Since we dry camp or boondock over half of the time, we have to pay RV dump fees. When we’re dry camping, we typically have to dump the tanks every 7-8 days. We’ve found gas stations or travel stations to be the cheapest – and sometimes free. When there isn’t one close by, we typically pay $10 to use one at an RV Park. Of course, if you’re staying at an RV park, you can dump the tanks for free. Before we hit the road, we upgraded our cell phone plan to the Unlimited Plan with Verizon. We use our phones as hot spots for internet, so we knew we’d blow through the data in no time. For the most part, we’ve had good coverage and no issues using our hot spots to get work done. We also use our hot spots to stream Netflix – on the rare occasion we want to watch TV. Laundry budget. This is my least favorite chore – even before full-time RVing. So now that we have to pack everything up and go to a laundromat, it’s really not my favorite. But it has to be done. Some RV parks will have washers and dryers onsite, but if you’re boondocking a lot like us, you’ll find yourself at the laundromat. We probably do laundry 2-3 a month. If you can find a place that has the industrial size washers and dryers, then you’re in luck. You can wash about 8 loads in one machine for $8. If we’re washing clothes, bedding, towels and the dogs’ stuff, we spend about $18-20 to wash and dry it all. We really weren’t sure how much to budget per month for propane. We read online that one family spend $40 a month, so that’s what we originally budgeted. Luckily, we don’t spend anywhere close to that. We refilled our propane tank about a month ago for $5, and that should last us another month or so. We only use propane for cooking and heating the hot water tank. We don’t use our furnace – we have a little Mr. Buddy Heater that we using sparingly if it gets really cold. We eat out way less on the road than we did at home. Buying a bottle of wine from the store and drinking it outside under the stars is just as fun – if not more fun – as going out for drinks. We can go explore or hike for free versus paying for entertainment. We’re not buying little things (coffee or smoothies or delicious treats from Whole Foods) on the way to work or on the weekends just because. We do spend fun money on is the occasional date night, fishing licenses, and drinks if we’re meeting up with someone. We also purchased the America the Beautiful National Park pass, which I highly recommend. The pass costs $80 annually, and it gets you into all the National Parks. Normal living expenses include food, cleaning supplies, toiletries, health insurance – all the non-specific RV items you already pay for. This varies from family to family and shouldn’t change too much from your current budget. Except there’s a lot less space to clean meaning less cleaning supplies! *This doesn’t include the last two items: Fun Money and Normal Living Expenses. 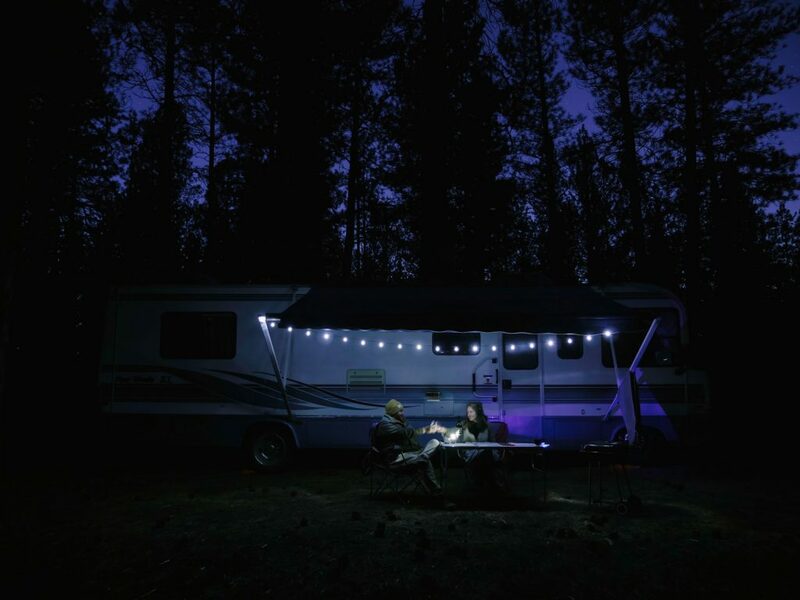 Ready to start planning your full-time RV budget? Download our interactive budgeting spreadsheet. Let us know what questions do you have about full-time RVing? We’ll be happy to answer them! Hey there! Such a helpful post! 🙂 I don’t see the download link anywhere though — would love to use it! I am also having trouble downloading the worksheet. I really enjoyed this article! Hi Jordan, I’ll email you a copy. thanks! Thanks for the worksheet and these tips to help us decide if we should make the lifestyle change. Lots to think about. You’re welcome. If you have any questions, feel free to reach out! Once we retire, my wife and I are planning on spending winters (at least) heading south from Chicago in an RV for maybe 3 months at a time. I’m an over-researcher according to her, but also an accountant. 🙂 I’d love to play with your budgeting worksheet. Unfortunately, I can’t seem to find the link on your website. Is there a specific page where I can find it? Such a helpful breakdown !!!! I’m just curious if the majority of your boon docking spots have had enough cell phone service to use the wifi for work purposes? Thank you ! It’s hit or miss, but typically, we had enough service to call and text and usually to run our hot spots for work. Occasionally, we’d have to drive to a nearby town. Some of the boondocking apps will have reviews on how good the service is, so check those out! Hi! I didn’t see anything about generator and electricity costs. Hi, we installed solar panels so we rarely ran our generator. Any electricity costs we had were covered with campground fees, but we mostly boondocked (camped for free without hookups). Sorry, I don’t have a good answer for the extra fuel cost of running the generator. Hey There – I’m a single guy. Gonna RV full time (never done it before) starting spring of 2020. You may have an answer to two questions – how to lodge for cheap (or free) and how to get my high energy dog some good off leash time. So I am looking for a resource that show me the BLM or National Forests that work for boon docking and dog running. Hey, first off, congrats on starting your planning! We have a post on finding free camping spots here: 3 Tips to Find a Great RV Boondocking Spot. BLM land is great for off-leash time. National Park and State Parks not so much, but you’ll occasionally find campgrounds with little dog parks.